For now, I only have these sprites (the original 32-bit RKS Sprites, my 8-bit versions enlarged by x2, and the original sized 8-bit versions). If any of you would like to edit them into other poses or help me in any other form or way, that would be great. Of course, you can just leave your honest thoughts. Do you plan to do a revamp of the characters only or even the stages an backgrounds ? This would be huge work, if it's the last solution. Which software do you use for making the sprites ? The ideal thing would be to make 8bits remixes of the stage theme, too. Like using Famitracker for instance (my brother made some arranges using that, which seems... complicated to me ). Yep, the whole entire game. I'm probably just going to use Photoshop and reduce the number of colors used on the backgrounds and tilesets, and the mugshots as well. 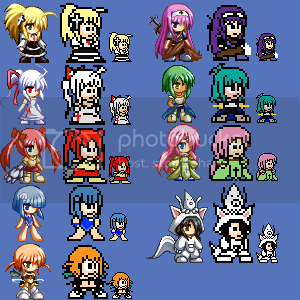 I was hoping I could get ShivaDF's help, since she is good at editing sprites, so I wanted to see if she could complete the sprites of the girls I started on. Initially, I mistook 8-Bit!Luste's smile for a frown before recognizing it as such. Other than that, those sprites look excellent. Also, how will you do the Stage Select screen? More like Mega Man's, or like RKS's, but without the scrolling BG? Make it all a symmetrical gradient with only about three or four shades of blue, in such a fashion that it will all look the same even with the scrolling BG. I still have in mind the Ocarina of Time 8bits project, some of you might have heard f it. The guy who had this idea went mad, in front of the task... RKS should be a lot easier to "downgrade" (err...) in 8bits, but it won't gonna be easy ! Good luck, we'll stay tuned then ! Now I will warn you that it took me half a year to get three animations done. However, I could probably do better now. The backgrounds will be difficult. I have no experience making tiles, and the only person I know who is good at that sort of thing has never heard of rks. Remember that Spiritia redesign you submitted onto dA? I remember you flat-out said you edit sprites. For the backgrounds, I was thinking of reducing the colors used in the image, then shrinking down the BG down to half it's original size, thus decreasing the resolution, then returning it to it's original size. I can probably do the human characters and a great amount of the enemies, but the larger enemies and bosses will be much more difficult. I would love to show you a few more previews, but Photobucket doesn't want me to upload anything for absolutely no reason. You could always use Tinypic. I'm curious to see the result of downgrading the resolution... That could work. Photobucket's no longer being a loyal pain in the bum, so I finally get to showcase this. Here's a sample of Spiritia's sheet, which has all her sprites excluding her climbing, laying and holding sprites. I want you to post some backgrounds. That's nicely done, how many time did you spend to make these Spiritia sprites ? 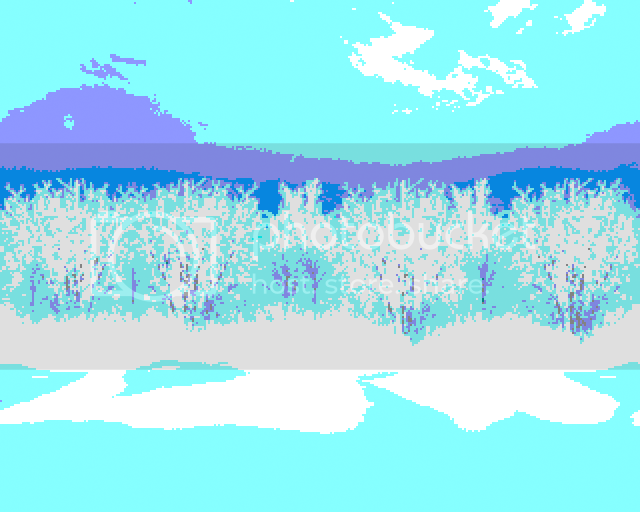 Here's the background to the first part of Freudia's stage. Looks beautiful, if I say so myself! Very nice result ! Much better that what I had expected, this method seems the way to follow. Been a while since I came here. Why don't you find someone to hack a Megaman nes rom? There's tons of them out there, so take a look at them (Rockman no contancy and Rockman Exile at the top of my head). I'm guessing here, but I guess you don't have any programming skills, and programming an engine from scratch is something one should not do alone. The 8-bit mod is a graphical hack of the original RKS, not a game created entirely from scratch. It should be easier then, just replacing some files here and then. Even so, I'd like one rom hack. Truly 8-bit RKS instead of just a mask. I'm one of those who is pro 8-bit, so good luck with that. Hacking, yeah but RKS is already an heavy hack of the Rockman series on the physical side. Keeping the original engine should be fine, making an entirely new level design is what would bring the most of the pain, it'd take years for a single person to have a good result !